–The ozone layer that is found in the stratosphere shields the Earth from ultraviolet rays in the sun’s radiation. 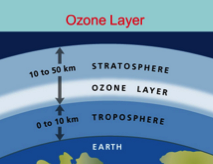 –The ozone is a form of oxygen which has three oxygen atoms combined instead of two. –The radiation from the sun breaks these down into plain elemental oxygen (O), which then go and combine with O2 molecules to form O3 once again. –The ultraviolet radiation is what breaks down the O3. 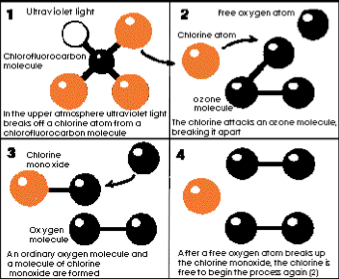 –In 1974, two chemists, F. Sherwood Rowland and Mario J. Molina realized chlorine from chlorofluorocarbon (CFC) was breaking down the ozone in the stratosphere. –When the CFCs are present in the atmosphere they rise up and are broken apart by solar radiation. When this happens, chlorine atoms are released which strip the oxygen chemicals away from the ozone and destroy them. One atom of chlorine is able to destroy more than 100,000 molecules of ozone. –When the ozone is thinned out, ultraviolet radiation from the sun can reach the surface of the earth. 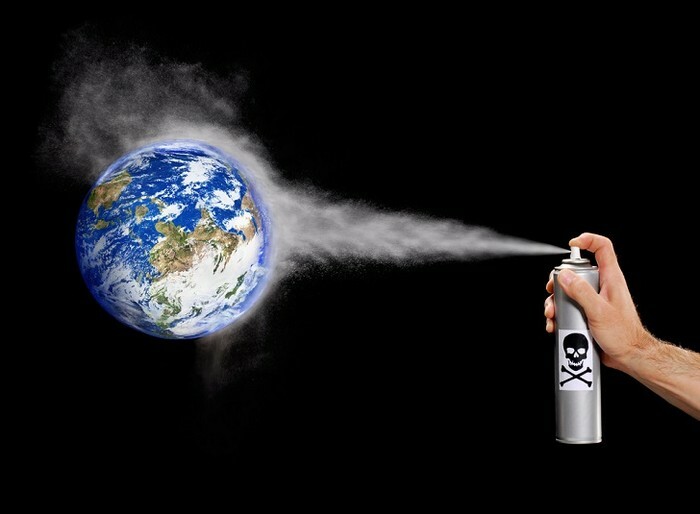 –The CFCs are from pollution, and are found mainly in aerosols you spray, heavily used by industrial nations for most of the past 50 years. –Ultraviolet rays can cause skin cancer. –They also cause cataracts in humans and animals. –The rays also affect the reproduction of single-celled organisms such as plankton and algae. –The food chain will be affected by the decrease in single celled organisms and other animal populations will become lower. 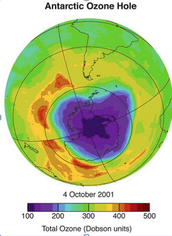 –The ozone hole is an area in the atmosphere over Antarctica. –This area becomes less concentrated with gases every spring. –This problem was first noticed in the late 1970’s. –Researchers led by Joseph C. Farman, a British atmospheric scientist showed the hole had grown since the 1960’s. –This is caused by the cold weather and chemical activity every year. –Removing some of the excess chlorine and the bromine in the stratosphere. –This would mean not creating chemicals like CFCs or several others. - Building a machine to find and eliminate only chlorine and bromine in the stratosphere. - The Atmosphere would be less polluted. –You can use eco-friendly household cleaning products. –This will help prevent ozone depletion and still allow you to keep your home clean. - This will not totally solve the problem but be a big help considering what people use to clean their houses and knowing many people clean their houses at least once a week. Solution 1 is better and will be more effective. Even though it might take a little time to build a device to take them out of the atmosphere, it will be more productive and help more. This way it's literally destroying the molecules whereas if you went with solution 2, you'd only prevent more from being released into the atmosphere and not take out the harmful ones already up there. If solution 1 worked, people could make more devices and place them all over. It might be hard to build a machine that can detect and destroy only chlorine molecules, but if it was done, it would help a lot!